If this is your first visit to CwHD, a brief introduction is available. Just click on the CwHD Intro link. To return, simply click the Home link. Conversations with a Hypoxic Dog began on May 1 of this year. On Thursday, November 6, a new format will be launched. Words and Language and other Nonsense will remain the focus; but a bit of History will be added. Historically, words misconstrued have created a great deal of mischief. In 1977, Jimmy Carter, then newly elected President, fell victim to inept translations. He said that he was happy to be in Poland; the translator rendered this as "... he was happy to grasp at Poland's private parts." Carter suffered several such incidents and became, literally, a Polish Joke. Each week Miss Construed will visit CwHD with examples of and insights into word gaffs. How curious to think that an Italian astronomer's use of the 'canali' in his 1877 description of the Martian surface would lead to Orson Welles' classic 1938 radio broadcast 'The War of the Worlds'. Adapted from the novel by H.G. 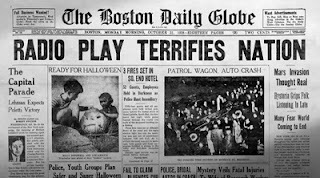 Wells, the broadcast caused a good deal of panic as a sizable number of citizens throughout the country thought they were listening to an actual news broadcast. History also has its part to play in the ongoing travelogue, "A Brief History Of The Columbia River.' Travel literature is an old and respected genre. A Greek named Pausanias who lived some 2000 years ago is often mentioned as one of the earliest travel memoirest; but examples of the genre are fairly common in both Arabic and Chinese literature. In 1336, Petrarch's climb on Mt Ventoux in France is often noted as the first mention of traveling simply for the sake of enjoyment. Petrarch wrote that he climbed Ventoux just for the pleasure of seeing the view from its famous height. In the 17th century, Japanese poet Bashō undertook several journeys for no other purpose than to visit friends and famous sites. His The Narrow Road To The Deep North is the definitive work of poetic prose. By the 19th century, young English travelers had created the concept of The Grand Tour. Before a career could begin, one must travel to broaden one's horizons. Often a written account followed. This literature of tourism was pioneered by Robert Louis Stevenson. 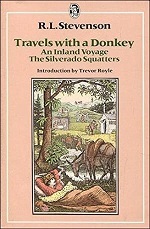 His An Inland Voyage (1878) and Travels with a Donkey in the Cévennes (1879) are among the first books to suggest that camping might be an acceptable recreation. These tales of bold journeys by mere tourists help to popularize the narratives of more daunting exploration. Cook's voyages, Byrd's attempt on the South Pole, Lindbergh's flight all became required reading. Darwin's account of his voyage in the Beagle has a far greater readership than his more important On The Origin of Species. And The Journals of Lewis and Clark are widely read and studied for their first glimpse of the Pacific Northwest despite the errant spelling, capitalization, and syntax. H. W. Tilman's climbing in the Himalaya in the 1930s and his subsequent sails to high latitudes in the 1950s provided the grist for many such tales. And it was Tilman's understated style that became the model for most of the writers who followed. Please leave a comment or question in the Comments box below (click on No Comments to access comments box). You may add your email address or publish anonymously. Preview your comments, then Publish. The Z-dog thanks you. If you have arrived here by happenstance, words and language are what you will find. A few photographs. Visit my website at majikwoids.wixsite.